This is an excellent combination of flavors, and lovely to behold! Salmon just begs for something fruity…it just does, don’t you think? 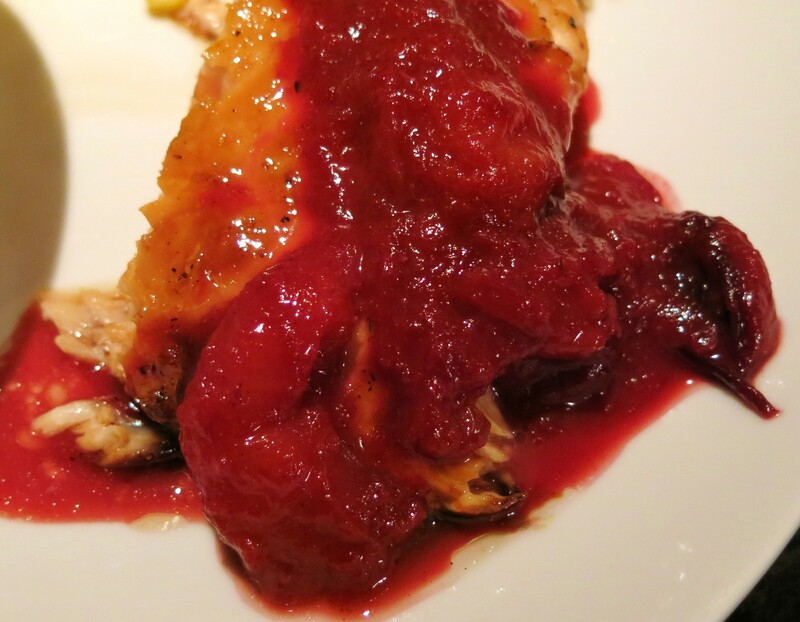 This is the simplest of preparation and but you get a lovely fish, with great flavor and the plum compote is good on so many things. 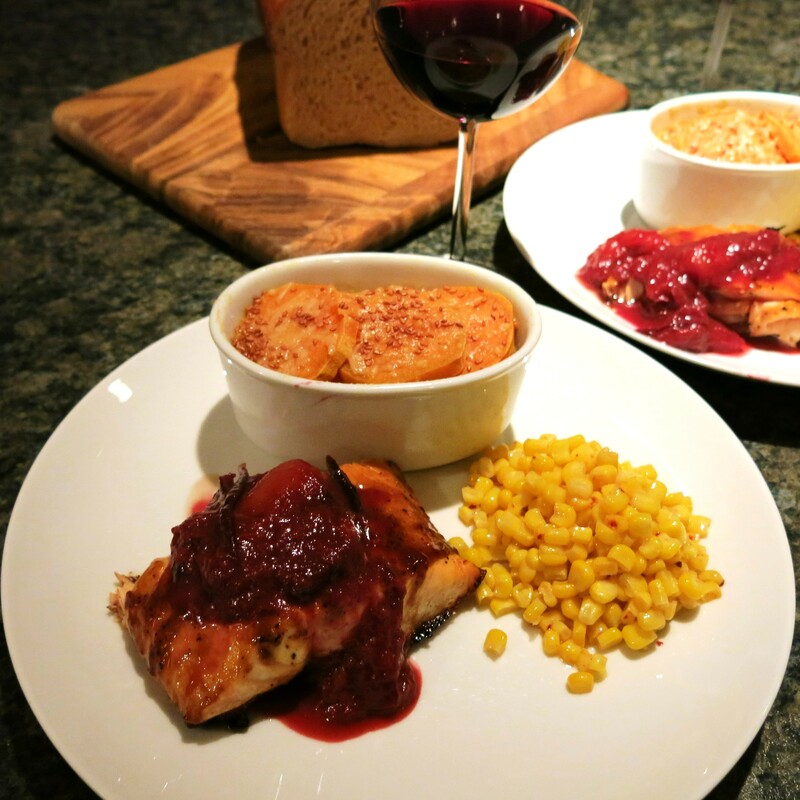 Plum and salmon are a wonderful flavor combination, but in light of the fact that spring appears to have sprung, you may wish to use the Rhubarb-Hibiscus Sauce. It not only tastes delicious, but it also is gorgeous with salmon. Yes, salmon seems like a perfect choice for dinner. Combine the orange juice concentrate, hoisin and honey. Place a non-stick or heavy (cast iron is great) skillet over medium-high heat; drizzle with a bit of oil. 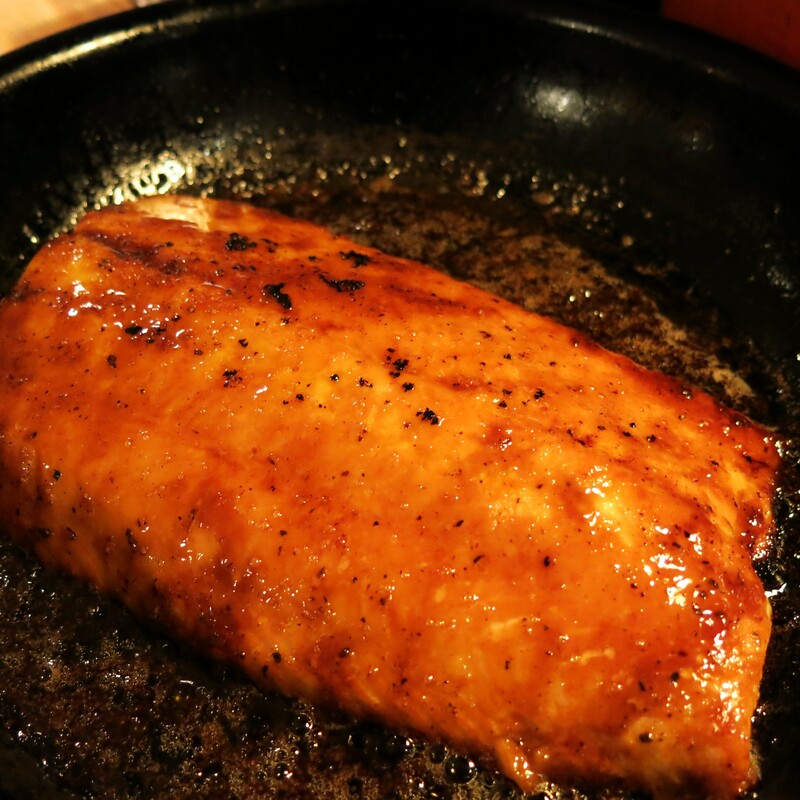 Place the salmon filet, skin-side down in the hot skillet. Smear the hoisin mixture over the salmon and sprinkle with salt and ground pink peppercorns. Sauté the salmon for 4-5 minutes or until the edges begin to brown. Slide the skillet under the broil and broil until the topping is all bubbly and the salmon is almost cooked through (it will finish cooking for a few minutes after you remove the pan from the oven. 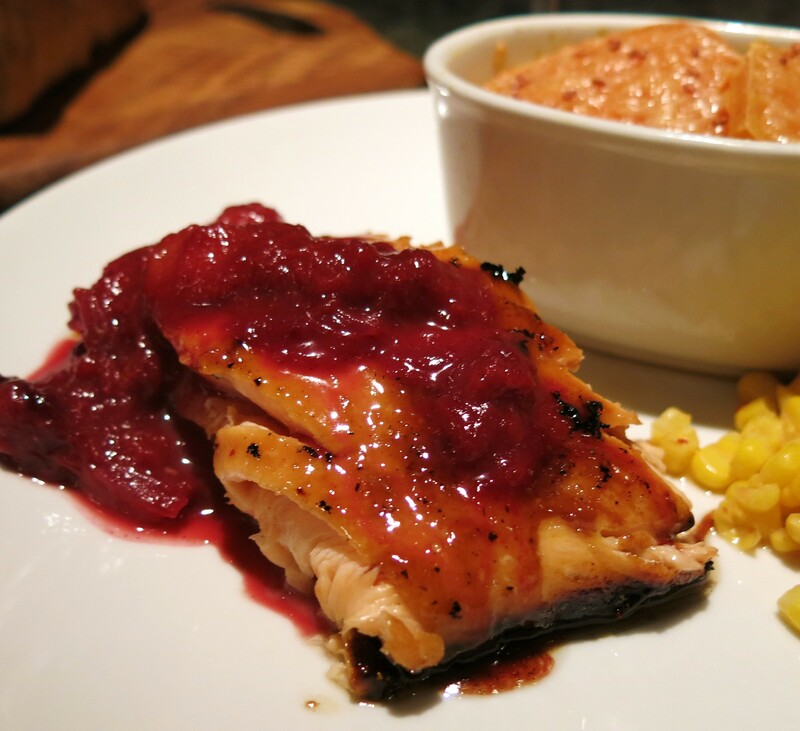 Serve the salmon immediately as is or with a baked sweet potato and the Spiced Plum Compote on the side or underneath the salmon portion. 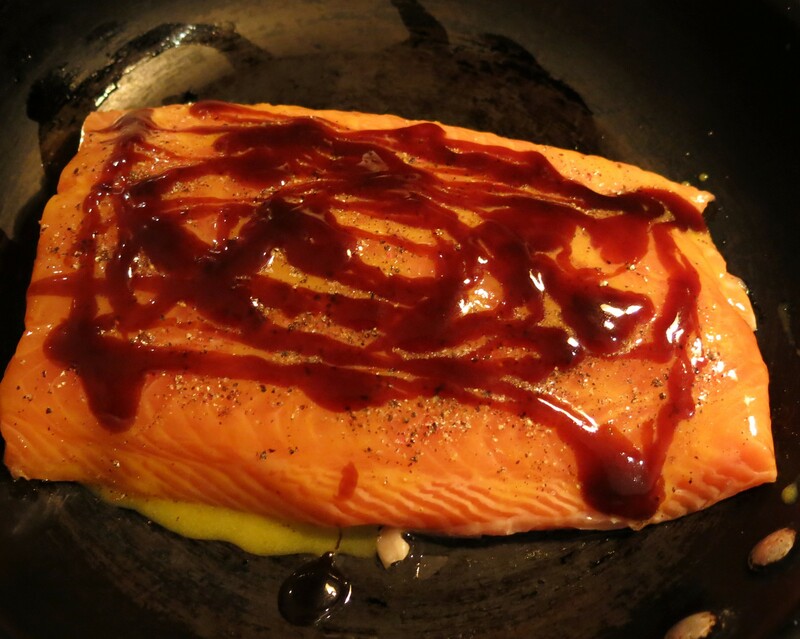 Hoisin-Glazed Salmon Recipe©Marcia Lahens 2015. All rights reserved. and then into the oven for the final cooking. The real key is not over-cooking the salmon. This compote is delicious as is, but is just terrific with the salmon. It is equally at home on the plate with pork, chicken, duck and shrimp…very flexible. It’s pretty good, with a spoon, right out of the saucepan! Heat the butter in a small heavy saucepan over medium heat. Add the onion and sauté for 2 minutes. Add the remaining ingredients and gently boil (a little more than a simmer) for 5-8 minutes until the plums cook to pieces and the mixture thickens just slightly. Serve with the Hoisin-Glazed Salmon or Pork Roast. NOTE: This is excellent with 1 tablespoon of finely shredded fresh ginger and 1 teaspoon whole mustard seeds added. When using the mustard seeds, you may wish to add them to the broth and let them stand for 20 minutes. Spiced Plum Compote Recipe©Marcia Lahens 2015. All rights reserved. I served this with baked sweet potatoes and corn. I prefer red wine with salmon, so a lovely Chilean red was perfect with The Latin Lover on the side…by my side!